My kitchen sees a bunch of activity in a given day. There's the regular cooking and eating to simply sustain us, but there's also recipe development for private clients and magazine writing assignments, there's herbal medicine creating, and much more that goes on in there. All that activity means the counters need cleaned, often. Most of the time, I simply use hot soap and water or some diluted vinegar. Both those things work well for me and tend to clean up most every mess we make. I never expected to change that until I saw the recipe for this Thyme Counter Cleaning Spray and well let's just say that this has changed my kitchen cleaning routine in all the best ways. I've been a huge fan of Jan over at Nerdy Farm Wife for years. Her DIY projects are always so very doable and practical, not to mention beautifully photographed. Her new book, 101 Easy Homemade Products for Your Skin, Health & Home gives us all of the practical and beautiful in a resource perfect for every home's DIY library. It's a book, I know I'll turn to again and again for home use as well as amazing gift giving ideas. 101 Easy Homemade Products for Your Skin, Health & Home takes a wonderful approach to DIY body and home care products in that there is a heavy focus on using fresh and dried herbal and floral elements. I appreciate this as a gardener and avid forager who is always looking for new and practical ways to use my harvests and the shelves of dried items I put up each year. Too often, in my opinion, DIY books focus on heavy use of expensive and uncommon essential oils. Don't get me wrong, essential oils have their place in a handmade life but I appreciated that for the most part the recipes in this book skipped heavy essential oil use in favor of using the whole plant more often. For the beginner, the book gives all the basic steps necessary for infusing oil, includes substitution tips, and includes detailed instructions. For the more advanced there are plenty of ideas to get the creative juices flowing as well as projects for soaps using lye and much more. Projects included in the book include everything needed to wash and soften skin, ways to make baths more luxurious, herbal home remedy needs, solutions for homemaking, and even a section on taking care of those pets naturally. Truly it's a book for every body and every home interested in doing more of ‘it' themselves. It's a great way to be using up the summer garden for amazing homemade gifts for birthdays, holidays, and more. As I was going through the book, the thyme counter spray jumped out at me as the first product I wanted try. I had some dried thyme in the pantry and all of the other ingredients were also easily at hand. I knew that thyme was a natural antibacterial and figured the combination of soap and alcohol with that herb would be an amazing way to keep the counters clean without harsh chemicals and boy, is it! 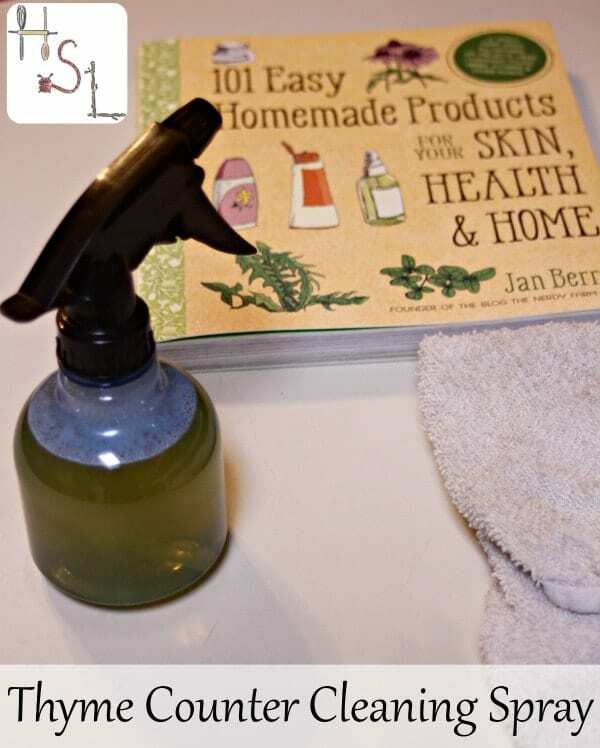 Use this Thyme Counter Cleaning Spray, from 101 Easy Homemade Products for Your Skin, Health & Home, to naturally and easily keep those counters clean. Put the thyme in a small jar and pour the alcohol over it. Cover and let infuse overnight. In the morning strain the leaves from the alcohol. Put the water and castile soap in a spray bottle and swirl gently to combine. Pour the infused alcohol into the bottle and swirl again. Cap with a spray and label the bottle. Shake gently before each use. I've been using this spray to clean my counters every day, multiple times a day, and must say it is effective and so easy to use. Simply spray on the dirty counters and wipe off with a clean rag. The alcohol means it dries fast and prevents streaking on those glossy counter tops. I know for my house, we'll be using this thyme counter cleaning spray instead of plain old vinegar from now on. I can't recommend this book highly enough. It truly is a book you'll be glad to have in own personal library. I do like the idea of using natural products where practical. So I appreciate the suggestion to use Thyme in a counter spray. However I will try simply adding it to my white vinegar and water mix (keep the rubbing alcohol for medical emergencies) Maybe the Thyme will stop DH complaining about the vinegar smell! If you don’t like the vinegar smell you can dissolve 2 tbsp of citric acid in a pint of hot water and add the oils to that instead. Could you use thyme EO instead of steeping the thyme overnight? And if the EO would work, than would i have to buy a glass bottle? I know lemon EO cannot be used in plastic bottles, but i don’t know about thyme. I imagine it could work but I don’t know for sure, nor do I know the amounts. I would recommend the glass bottle for anything for an essential oil it but again I’m not an essential oil expert by any stretch of the imagination. I’m sorry that’s not very helpful. Yes, you can use EO and yes you should store it in glass. I don’t know the exact amount but would guess around 20 drops. I don’t see much harm if it’s a bit on the strong side when cleaning counters. I love this but I think I’m going to use vodka as opposed to rubbing alcohol. Thanks for the recipe.